With its three famous trout rivers, River Kitkajoki, River Oulankajoki and River Kuusinkijoki, Kuusamo offers you a unique opportunity for going after the great brown trout in Finland. The brown trout rise to the Kuusamo rivers from Lake Paanajärvi and Lake Pääjärvi, which are both located on the Russian side of the border. The trout are born in rivers in Finland, and spend their first 3–5 years in their native river. Then they descend to the great Russian lakes to grow. 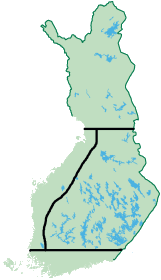 Some of the trout stay in Lake Paanajärvi, and some travel further down to Lake Pääjärvi. The fish return to Finland when they have grown to a weight of nearly two kilos. The purpose of their return is to procreate, i.e. the trout come to their birthplace to spawn. After the trout have risen to the river, they do not feed at all. This special characteristic, together with the exceptionally large size of the fish, is what makes the Paanajärvi trout unique in Finland. 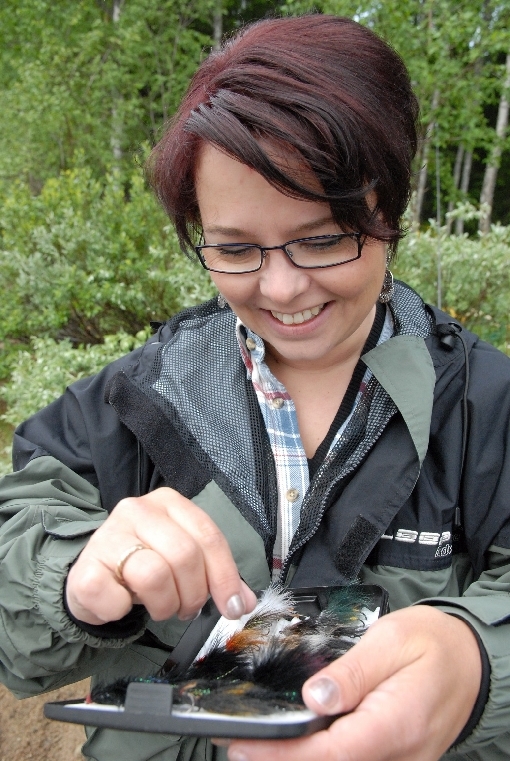 The Paanajärvi trout is temperamental and difficult to catch. There are many similarities between the behaviour of the rising brown trout and the Atlantic salmon. 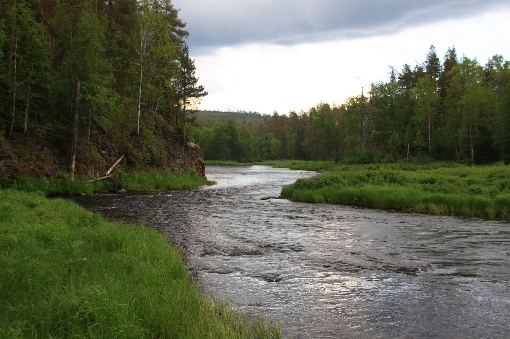 During the latest years, River Kitkajoki has been the home of the greatest brown trout. In addition to trout, the area is famous for its great natural beauty. The river flows in a deep canyon through handsome pine forests, between steep cliffs rising tens of metres above the streaming clear water. The river valley is at its most rugged in the area between the Jyrävä rapid and Harrisuvanto still water. After Päähkänäkallio the river flows into a spacious valley, where lusciously green meadows add to the beauty of the landscape. This river is not easy for most fishermen. A skilled angler can pick up a brown trout every now and then, and fill his basket with big grayling on the side. In order to catch trout, the angler has to know the best spots well, and the holes where the grayling lurk are not always easy to find. 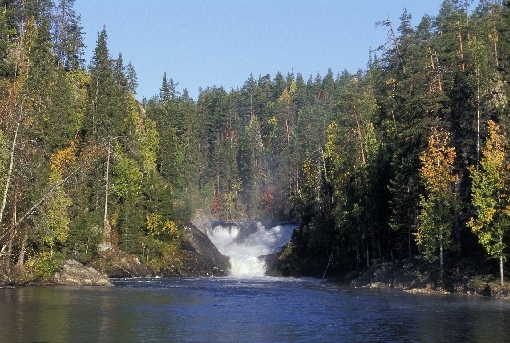 It is a well-known fact among fishermen that this river is one of the most challenging fishing destinations in Finland. The river is best suited for fishermen who enjoy trekking and brisk exercise. 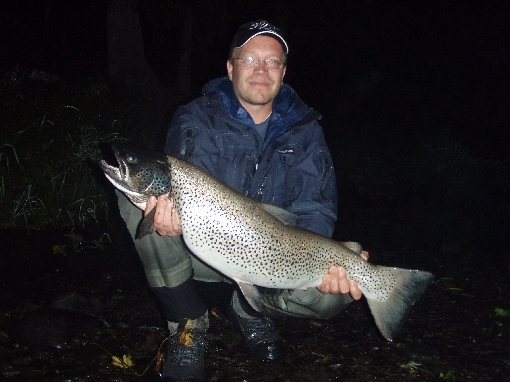 Then again, summer after summer, the biggest brown trout are caught from River Kitkajoki. 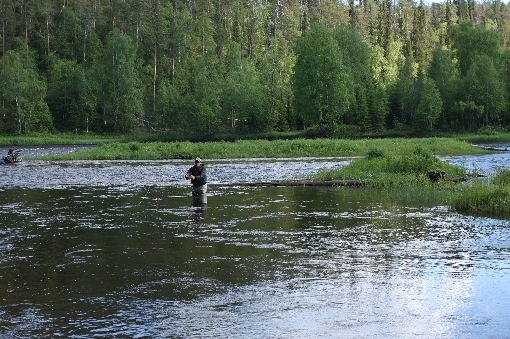 River Kitkajoki hosts a relatively generous grayling population, and whitefish is also abundant in places. In quiet waters there is a fair chance of catching pike. The average weight of brown trout caught from this river is approximately 3.5 kg. The fishing area is 14 km long, with half of the distance covered with rapids. 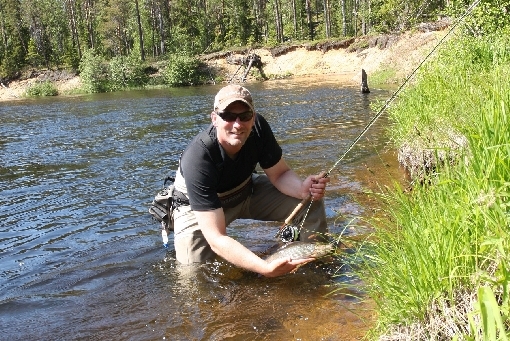 Fishing with dry fly on River Kuusinki. Of the three great trout rivers of Kuusamo, River Kuusinkijoki is the smallest in size and water quantity, but it is by no means the least in fame. The Kuusinki brown trout is wild and free, an unbelievable fighter at the end of the line, and so cunning that hooking it is never easy. Or maybe it is! In any case, brown trout is the most sought after catch at River Kuusinkijoki, and catching one is always a memorable occasion. The upper stretches of the river run mainly through wide, if somewhat bushy meadows. In the Kiukaankorva area and below, the river is squeezed between 20 metres high rocky walls for a couple of kilometres, after which it calms down at mid-reaches into a peaceful stream surrounded by grassy meadows. On the last stretch near Sipinkoski, before the river flows over the Russian border, the banks turn into cliffs rising higher and higher above the river. This is the beginning of the most ruggedly beautiful part of the whole river. There is a network of roads leading to both banks of River Kuusinkijoki, and the walking distance to the riverside is only a few hundred metres at worst. As far as grayling fishing is concerned, the lower reaches of the river make an interesting stretch. Especially in early summer, individuals of very respectable sizes are caught here. 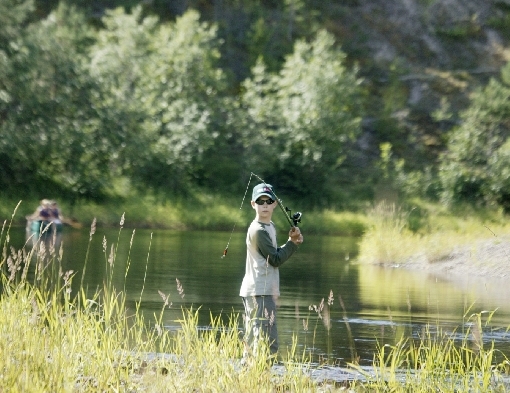 At Saunavaara, as well as at other most popular and crowded River Kuusinkijoki venues, it is customary that the fishermen take turns to fish the stretch. This way everyone is guaranteed a peaceful time to fish, free from disturbances. Landscape in the lower reaches of River Kuusinki. The story of the Kuusinki Camping Site began in the 1960s. Today, there are cabins available for 2-9 people, and caravan and tent sites in the area. The camping site café sells snacks, fishing equipment and fishing permits. Beer and cider are also available at the licenced café. The camping site is located on dry pine forest land, and the distance to the nearest fishing sites on the river is only a few hundred metres. The traditional sauna on the camping site is famous for its gentle steam, and there is nothing more satisfying than ending a day of fishing with a bath in the sauna and a swim in the crystal-clear water of Lake Vartiolampi. 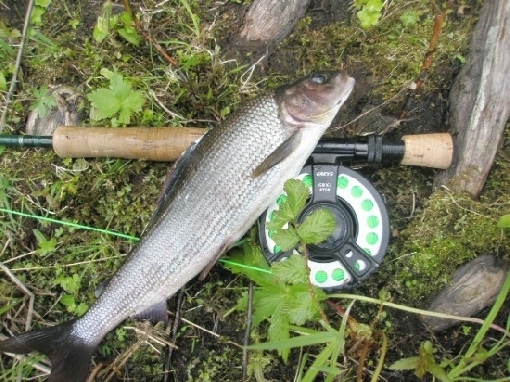 A grayling took a fly on River Kuusinki. The best sandy beaches in Kuusamo are found at River Oulankajoki. 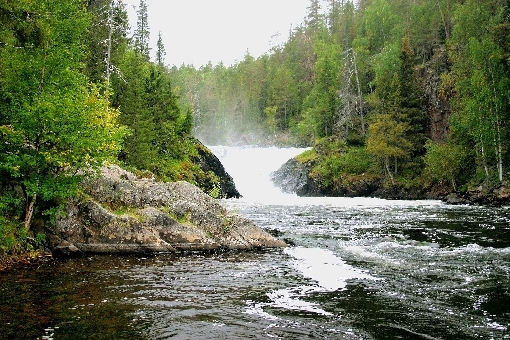 River Kitkajoki is more rugged and wild with its rolling rapids and quiet waters alternating between deep canyon banks. These rivers are situated in the middle of Finland’s most beautiful wilderness, but they are still very easily accessible. Despite its grandness and beauty, River Oulankajoki is not visited by as many fishers as its two tributaries, River Kitkajoki and River Kuusinkijoki. The most famous hiking trail in Finland, Karhunkierros, follows River Oulankajoki and River Kitkajoki in many places. It is advisable to bring fishing equipment with you on a hike along Karhunkierros Trail, as there are also many good wilderness lakes on the way. The lower reaches of River Oulankajoki are perfect for canoeing. It is easy to set canoes or kayaks to the water right below Kiutaköngäs, and there are no dangerous or difficult rapids downstream from there. 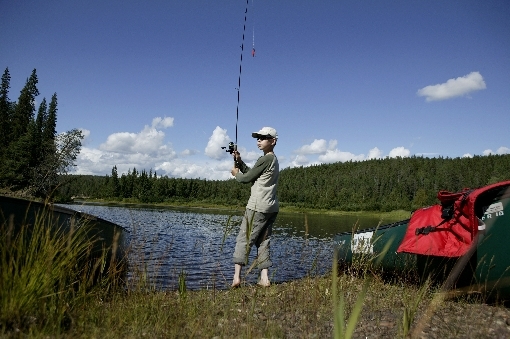 A spinning rod or fly fishing gear travels easily in a canoe. At places of deep water and brisk flow you can stop for a while and do some casting from a sandy beach. 1. Large selection of guided fishing trips with professional fishing guides. 2. Tranquil fishing in streams with easy access. 3. Great, wild rivers meandering through the rugged landscape of Oulanka National Park, member of European PAN Parks network. 5. The migrating Oulanka trout, wild trout population, lives on both sides of the border and migrates across to spawn. 6. 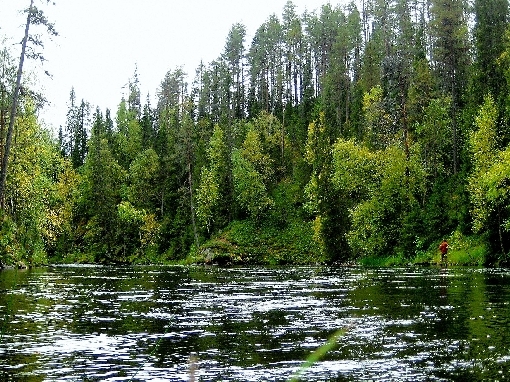 Fishing trips to Russian Karelia and the salmon rivers of Kola.